Cheap Car Insurance Windsor, Compare Lowest Quotes & Save! Call or Click to Save on Windsor Car Insurance! Getting Cheap Windsor Car Insurance Quotes Is Easy! For over 45 years, ThinkInsure has provided Windsor drivers with great car insurance coverage at the best rates by offering the cheapest auto insurance quotes. And we plan to keep doing so. Find out why Windsor drivers pick ThinkInsure as their preferred car insurance provider. Save Money : This is the goal when getting a car insurance quote, right? Did you know that our average customer saves over $400 each year? That’s pretty good. 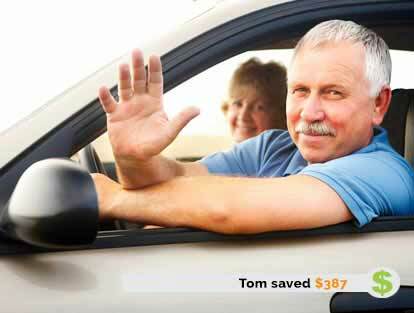 Become a customer today and save money on your auto insurance coverage with ThinkInsure. Save Time : Frustrated by how long it takes to shop for car insurance? Fear not – ThinkInsure has the solution. Let us do the shopping for you – saving you time and allowing you to worry about other things. Access to Insurance Quotes From 40+ Companies : Compare car insurance quotes from our insurance partners and choose the option that best meets your car insurance needs. Customer Satisfaction : Delivering exceptional customer service is a top priority for us. Our team of friendly and experienced insurance experts are here to help you with all your insurance needs – quotes, claims, questions, advice and so much more. Getting Your Insurance Is Easy With Us : At ThinkInsure, we strive to make the process of comparing car insurance options fast, easy, and convenient. You can get an online quick quote or you can call 1-855-550-5515 to find the best car insurance at the lowest price in Windsor. What are you waiting for? Bundle Car + Home Insurance in Windsor and save up to 20% more! Compare Windsor Car Insurance Quotes, get the coverage you need and start saving today! Shopping for car insurance in Windsor? We know cheap auto insurance quotes are what you want, and ThinkInsure is here to deliver. After all, it’s what we do best. Whether you are simply renewing your current car insurance policy, adding a secondary driver, or are shopping for car insurance rates for the very first time, getting a quote and exploring what the insurance market has to offer is always your best option to save money and ensure you get the coverage you need to meet your specific driving needs. The good news is that getting the cheapest Windsor car insurance quotes is easier than you think. With access to more than 40 of the top insurance providers in the industry, ThinkInsure provides you with options – lots of options! Simply fill out your information online and let us do the shopping for you. There is no need to go from insurer to insurer in Windsor, and you’ll have accurate assessment of your insurance options. Learn more about how to get cheap car insurance quote online with ThinkInsure. As an independent insurance provider in Windsor, our main focus is you – our valued customers. Our main priority is to make getting cheap car insurance quotes as simple as possible. We’re your advocate, resource, and best option to shop for car insurance quotes and save money on your rates. Getting Windsor Insurance Quotes Is As Simple As 1-2-3 – Save! You fill out a quote online. We’ll shop from multiple insurance companies in Ontario to get you the best rates. You choose your car insurance coverage, get the best price in Windsor and save! When shopping for car insurance, we know that saving time and saving money are two of your top priorities. We know you don’t want to spend hours and hours comparing your insurance options each time your policy comes up for renewal. We also know you want to get the best car insurance rates in Windsor and keep your insurance costs to a minimum while still getting high quality coverage. We save you time by comparing car insurance coverage and rates for you. We help you get the best rates by comparing your options with our 40+ insurance partners. One of the most southern cities in Ontario, and all of Canada for that matter, Windsor, Ontario is a busy border city that is located on the shores of Lake Erie. Known as the home of the auto industry in Canada, it has a very storied history as well as close ties to Detroit. It has also been coined the City of Roses for the vast array of flowers that are located throughout the city. It has also been home to thousands of monarch butterflies for more than a hundred years, and the city also played a pivotal role in the Underground Railroad. Home to well over 300,000 residents in the Windsor Metropolitan area (which includes Lakeshore, LaSalle, Tecumseh, and Amherstburg), it has a diverse population. However, the city is perhaps best known for its tourist attractions and easy access to Detroit. Each year, thousands of tourists drive from other cities in Ontario and from across Michigan to attend school at the University of Windsor and St. Clair College, as well as visit Caesars Windsor, the Lake Erie North Shore Wine Region, the Hiram Walker Distillery, and beautiful riverfront park system, which is home to great restaurants and outdoor festivals throughout the summer months. One of the unique things about Windsor is that it is located across the river, only a half-mile from Detroit, Michigan. 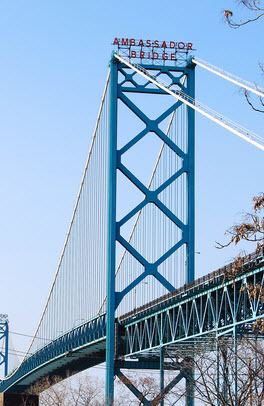 Therefore, many cars and trucks pass through the city on a daily basis when crossing the border at Ambassador Bridge or the Windsor-Detroit tunnel – the second busiest border crossing in North America. Windsor is also the ending point of the 401 highway series to the south. The vast majority of visitors to the city travel by car, and being a border city, Windsor experiences large volumes of traffic from trucks shipping goods, and U.S. drivers. If you are planning a cross-border trip, make sure you check ahead of time which border crossing has the smallest wait time. If possible, avoid driving along the waterfront. The city is investing in this area and construction is ongoing. Find an alternative route. To avoid long wait times at the border, try to plan trips around busy times. Be conscious of drivers from the U.S. who might not be familiar with Canadian road rules and signs. As the 401 comes to an end, if you are not planning to go to the U.S., be on the lookout for the last exit before approaching the Ambassador Bridge. The EC Row Expressway is known for traffic delays. If you need to travel east to west, plan an alternative route to save time, especially during rush hour. Armed with high quality car insurance coverage and these driving tips, you’ll have no trouble navigating the streets of Windsor and maintaining a clean driving record. Tired of paying too much for car insurance? Do something about it by getting an Online Quick Quote right now. Call 1-855-550-5515 to discuss your car insurance coverage needs with a ThinkInsure insurance expert. Windsor residents - it's time to start saving!